I don’t know about you, but I hate feeling rushed when I’m shopping for something important. This is especially true for health care for me and my family, and an important deadline is coming up. December 15th is the last day to enroll, renew or change your Marketplace insurance plan and have coverage begin on January 1, 2016. That’s why we’re reaching out. Working America Health Care is here to help connect you to the right insurance plan on the Marketplace for 2016. Don’t wait until December 15th. Hold times can be especially long around deadlines. Call 888-276-2580 or visit our website to connect today. Many Working America members like you already have found affordable coverage this year. If you sign up through us, our recommended licensed professionals will be there to help do the same for you. They will answer questions and compare options together with you—at no extra cost. After you sign up for a plan, we’ve still got your back. Our exclusive Health Advocate service* will be there in 2016, providing assistance with issues like doctor searches or negotiating medical claims. The New Year can be a crazy time, but choosing your health plan should be hassle-free. Visit WorkingAmericaHealthCare.org before Dec. 15 to begin the no-stress search. This entry was posted in All News and tagged ACA, Affordable Care Act, health care, Working America Health Care on December 3, 2015 by admin. Still confused about the Affordable Care Act? 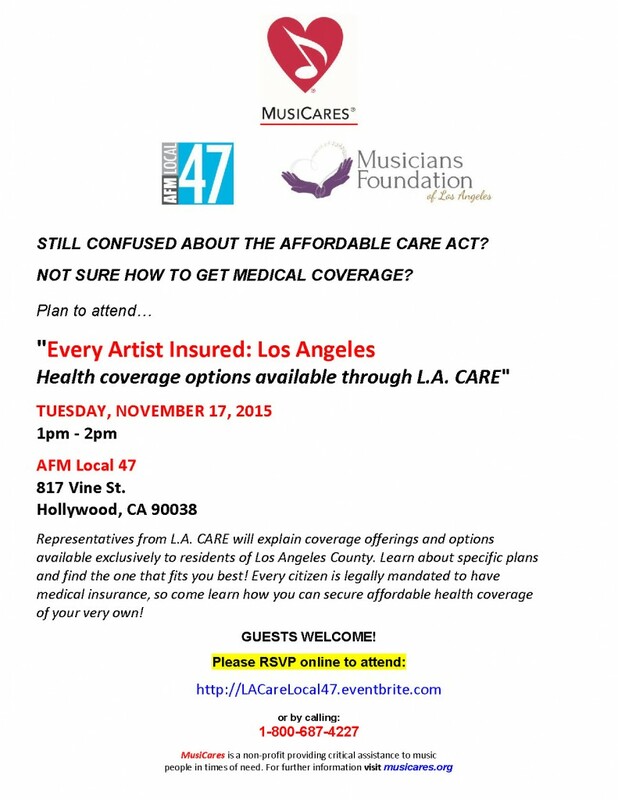 This entry was posted in All News, Events and tagged Affordable Care Act, free workshop, MusiCares, Musicians Foundation of Los Angeles on November 13, 2015 by admin.